Randall Grahm's Bonny Doon Vineyard stopped messing around with Cabernet Sauvignon in the 1980s, about the time he was anointed as the Rhône Ranger. One simply couldn't fly the Rhône banner with one hand while doing trade in the Bordeaux varieties with the other. Since his "come to Syrah" moment, Grahm has reportedly held "indifference, occasionally bordering on amused disdain," for Cabernet Sauvignon. 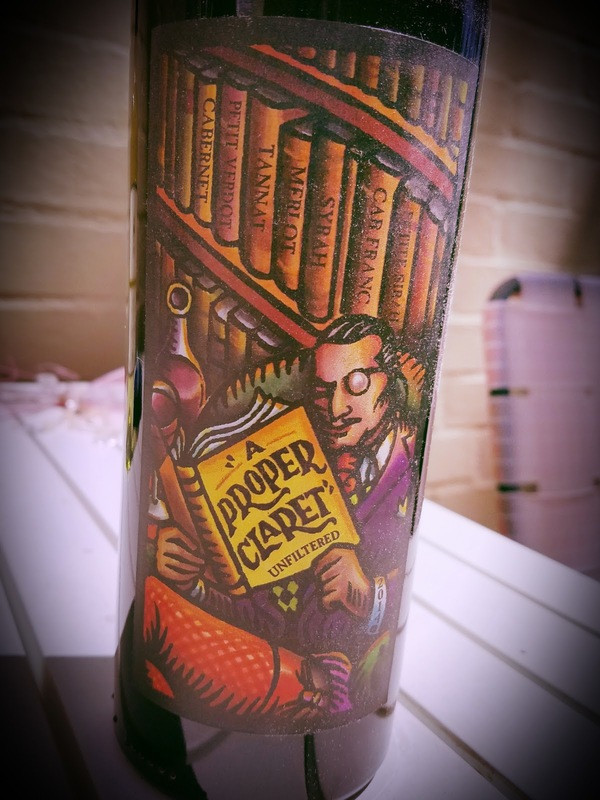 A Proper Claret 2014 is an oddity in the house of Doon, described by the winemaker as "lean, neither overly alcoholic … nor overly extracted, nor overly oaked." Grahm figures if you gotta drink a Cab, drink this one. The blend of grape varieties sorts out this way: 36% Cabernet Sauvignon, 22% Petit Verdot, 22% Tannat, 9% Syrah, 7% Merlot, 3% Cabernet Franc and 1% Petite Sirah. I think the healthy shot of Tannat is what made this Cab blend slip in with Mr. Grahm's somewhat grudging blessing. It carries alcohol lightly, 13.2% abv, and retails for a similarly light 16 bucks. The cross-dressing bookworm on the label is a Bascove creation, one that Grahm's veddy, veddy Proper alter-ego considers a "tasteless monstrosity." Nonetheless, it's there on the bottle. Bonny Doon wines always carry a note of sophisticated savoriness, unlike any Brand X you may care to compare. A Proper Claret 2014 adds a violet sense to the nose, possibly as a result of the healthy drop of Petit Verdot. Blackberry and leather aromas also decorate the scene. On the palate, APC shows a Pinotesque restraint and even a little tartness reminiscent of Pinot Noir. Savory cuts a wide swath through the abundant dark fruit, with black olives, dried tomatoes and smoked meat making appearances. The finish is rather long and the savory stuff stays longest. Spanish Wine Comes To L.A.